Colshaw Hall is a country estate venue located in Over Peover. Owned by the Irlam family, it is steeped in history but features fresh, contemporary interiors. 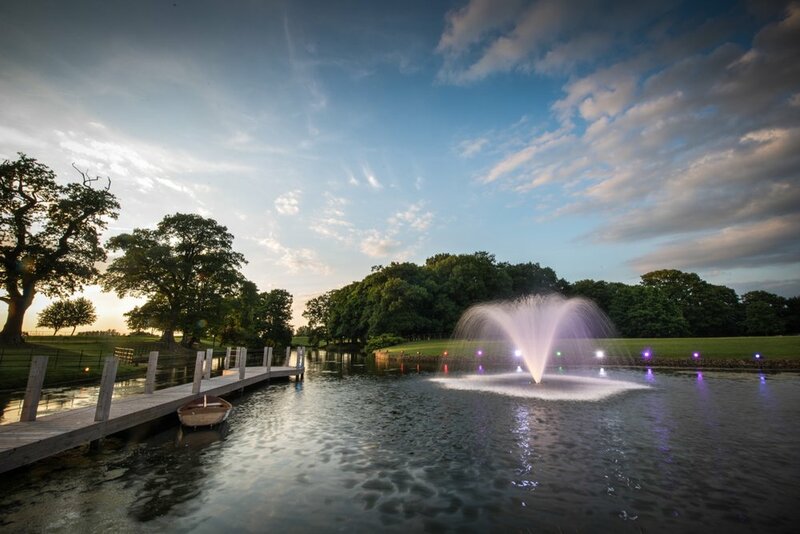 The estate boasts 300 acres of manicured gardens and countryside, which you’ll have exclusive use of and a stunning ceremony room to tie-the-knot. The Peel Suite and Pavilion Bar are fabulous spaces for dining and celebrating, and the jewel in the crown is a Grade II listed hall in which you can stay the night of your wedding. It’s a luxurious venue run by an attentive team who will do everything they can to make your day perfect. All you need in one place for your special day, whether it be small and select or large and loud. We have two lovely reception rooms, our restaurant and Tabley Suite or the Verandah Suite which can accommodate up to 120 guests. Onsite wedding organisers bring a lot of experience and laughter to help plan your perfect day. Country house aesthetic, contemporary design features and elegant furnishings. It’s almost as if Carden Park was made for winter. It is a venue that suits the season: guests can cosy up in front of one of the open log fires or stroll around the frosty grounds before warming up in one of the 198 recently refurbished bedrooms. Be married in the Shooting suite, a space that can accommodate up to 120 guests. Delivering country elegance, furnished with oak beams and open fireplaces, it offers a striking and romantic setting. Accompanied with its own private bar and lounge it also makes a great space for any wedding reception extras. With multiple other space options for weddings and receptions, arranging to take a tour around Carden Park will undoubtedly be worth it this festive season. 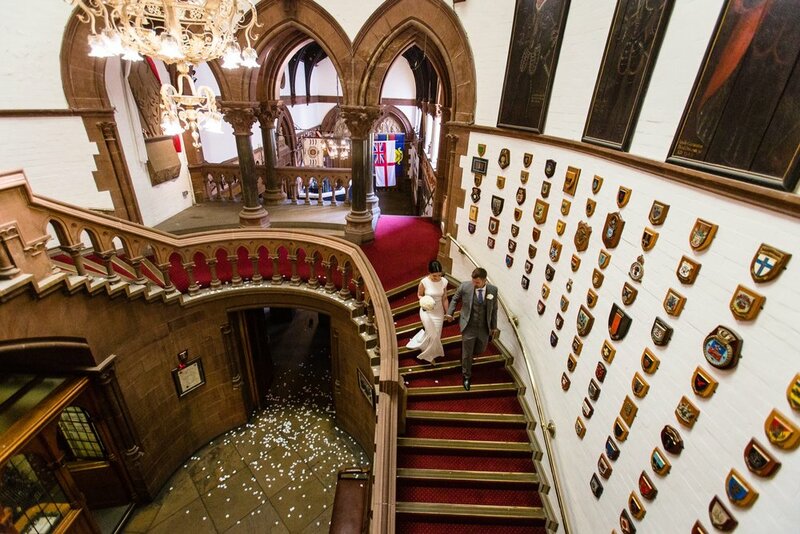 As one of the most desirable venues in Cheshire, with some of the richest history in the region, Chester Town Hall makes the perfect destination for wedding ceremonies and celebrations. Set in the heart of the city, the venue offers four unique rooms to hire, from grand to intimate there is something to suit every wedding. As guests enter, they are greeted by the stunning sweeping staircase, a fabulously impressive and colourful backdrop for photography. The Town Hall is licensed to conduct civil ceremonies and has a whole host of bright function spaces for the occasion. All ceremony rooms include a beautiful space for your ceremony, a wedding coordinator to help create your perfect day, fantastic photographic opportunities and a master of ceremonies. When the I do’s are done, Catering & Event creatives Horseradish offer reception packages delivering drinks and canapÈs through to wedding breakfast and evening buffet. Sister venue to Colshaw Hall, Merrydale Manor is fast becoming the place to host your wedding or special occasion in Cheshire. This private, exclusive-use country estate in Over Peover, features rolling countryside and luxe interiors. An oak-beamed civil ceremony room with limestone floors overlooks a tranquil lake with jetty - the perfect spot for pictures. The Merrydale Suite combines style and state-of-the-art facilities - perfect in which to dine and party! Choose to stay in the stunning manor house with friends and family and a further range of boutique style accommodation located on the estate. With its luxury design, elegance and vibrant atmosphere, Vermilion has become one of Manchester’s most iconic venues. Vermilion includes the critically acclaimed Asian Fusion restaurant & cocktail bar and most recently its new Wedding and Banqueting spaces. 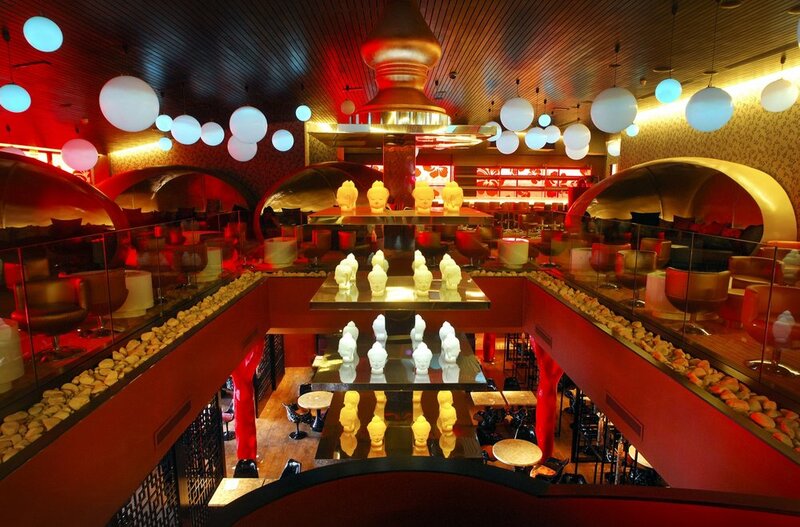 Designed by internationally renowned Miguel Cancio Martins (Buddha Bar, Paris), offering separately luxury designed spaces with the spectacular decor, and a sophisticated service and innovative culinary team, that can accommodate all your needs. Vermilion’s event spaces include The Abacus Gallery, with a capacity of 100, The Alan Turing Room with a capacity of 250 and the Grand Suite, with the capacity for 800 guests. Vermilion also includes 300 onsite car/coach parking facilities, breathtakingly high ceilings with no pillars, an array of opulent chandeliers, Eastern-influenced art and furnishing, bespoke mood lighting and a dedicated staff of professionals with vast experience from 5-star hotels are on hand to ensure you and your guests can relax and enjoy an unforgettable experience.